Happy Fall! What a great time of year. The days are getting cooler and shorter, but not cold, and it’s still light when I leave work. This is DC’s weather sweet spot, the best time to live in this area. Thankfully tourist season is over, or they would probably never leave! I am not sure why this dish jumped out at me from the latest Bon Appetit, but I am so glad it did. It’s a warm, filling one pot meal, but the flavors are really exceptional. Slightly lansagna-esque, but with a twist. This would be an excellent vegetarian main course, served with a simple side salad. Even if you don’t like eggplant, I would recommend giving it a try! The directions are long, but it’s pretty easy to pull together. Using a mandolin, or a very sharp knife, slice eggplant into 1/8 in rounds. This is slightly thinner than the original recipe. Divide eggplant between two baking sheets, overlapping slightly to fit. Drizzle 1 cup oil over; season with salt and pepper. Bake, turning eggplant and rotating sheets halfway through, until tender and golden brown, about 20 minutes. While the eggplant roasts, heat 2 tbsp. oil in a large saucepan over medium heat. Add onion; cook, stirring often, until softened, about 8 minutes. Add rice; cook, stirring constantly, for 3 minutes. Stir in saffron, then wine. Cook until wine reduces slightly, about 1 minute. Add broth; season with salt. Cover and cook over medium heat until rice is very al dente and still crunchy, about 6 minutes; remove pan from heat. Cover dish with foil and place on a baking sheet. It might bubble over, so this will keep your oven clean! Bake until sauce is bubbling and cheese is melted, about 15 minutes. Uncover dish and bake until golden on top, about 20 minutes longer. Let stand for at least 10 minutes to set before serving. Sprinkle with chopped basil and serve. This entry was posted in Family Dinners, One Pot Meal and tagged casserole, eggplant, mozzarella, rice by bistrobess. Bookmark the permalink. This looks absolutely fantastic! I can’t wait to try it. 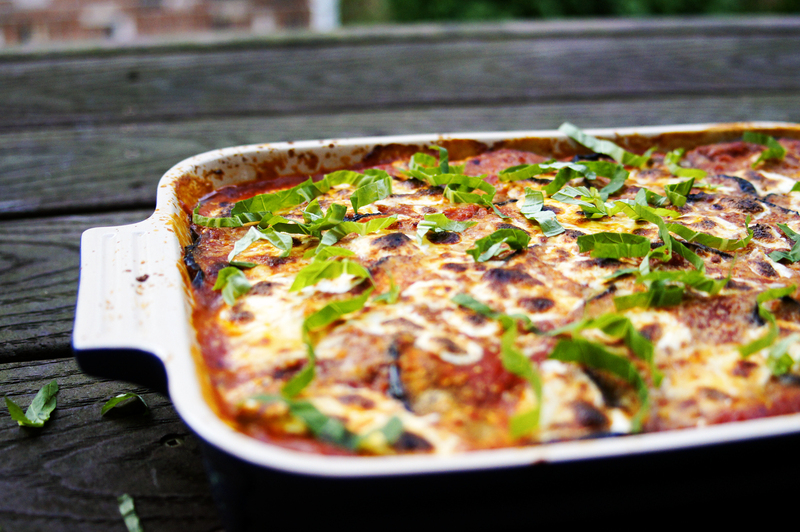 Just a quick question – Did you mean to bake the eggplant twice in the prep? Thank you for pointing that out! It was a editing problem on my part. You only roast the eggplant once, and then cook it again in the casserole. Appreciate the heads up! Made this, it was so good. I knew it was going to be tasty but even I was surprised just how delish it was! !